Abstract: Nurses, midwives, and paramedics are exposed to high degrees of job demand, which impacts health status and job satisfaction. The aim of this study was to explore the experiences and perceptions of health with a group of nurses, midwives and paramedics in Australia. Specifically, this paper reveals the findings related to the dataset on physical health. In this regard, the researchers sought to explore the relationship between physical health and job satisfaction, and the relationship between health status and stress levels. The study adopted a mixed methodology and used two methods for data collection: one-on-one interviews exploring the relationship between physical health and job satisfaction, and a survey questionnaire focusing on self-rated stress management. The individual interviews were conducted for further exploration of the participants' responses to the survey. There were 24 health care participants who were drawn from metropolitan and regional Australia. The findings revealed participants: had a desire to increase their physical activity levels; had different perspectives of physical health from those recommended by government guidelines; and viewed physical health as important to job satisfaction, yet related to stress and fatigue. Exploring health professionals’ perceptions of their own physical health stress and its possible relationships to job satisfaction was an important aim of the current research. While stress management within the health care field is not an entirely new research topic, less attention has focused on self-perceptions of health status and stress. Furthermore, this research built on previous research themes: stress is pervasive in all aspects of health care delivery; job satisfaction and retention are contingent on emotional health and wellness; health responsibility should be shared; and emotional health and physical health are connected.43 Specifically, this research sought to examine perceptions of current physical health status and the relationships between stress level and physical health and job satisfaction, in nurses, midwives, and paramedics in Australia. This study sought to explore: perceptions of physical health status; current stress levels; the relationship between health and job satisfaction; and the relationship between health and stress. The health participants were nurses, midwives, and paramedics. This mixed-method research design utilized two methods: semistructured interviews and a self-rated stress survey questionnaire. The mixed-methods design was intentionally chosen for its possible transformative approach, in contrast with traditional studies, where the voices of the participants are highlighted as integral to the study findings. Therefore, the researchers focused on hearing, listening, and validating the participants’ perceptions and experiences. Examples of the interview questions on physical health are outlined in Table 1. The Stress assessment scale,44 first published in 2010, showed previous content validity and interrater reliability, when tested on a population of nurses. The questionnaire assessed physical, psychological, spiritual, and cognitive behavioral aspects, identifying an overall stress level. The 25-item questionnaire utilized a five-point Likert scale. The scale was scored as: 5= strongly agree; 4= agree; 3= unsure; 2= disagree; and 1= strongly disagree. The highest stress score was 125 and the lowest, 25. The questionnaire was mailed to each participant, with the option for completion before or immediately following the interview. 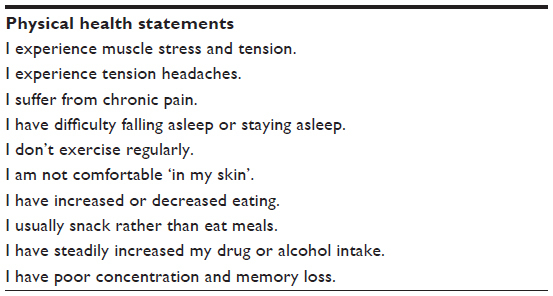 Examples of the statements on physical health from this assessment are outlined in Table 2. Currently practicing and employed in Australia. There were 51 practitioners expressing an interest in the study, yet work demands prevented 27 practitioners from proceeding. Following institutional human ethics committee approval and informed consent, data was collected from 24 practitioners who were from several different health care organizations. While most participants did acknowledge that they were experiencing considerable stress, this was not known until each interview took place. Each practitioner was interviewed in a mutually agreeable location. The interview duration was 30–60 minutes. The study data were collected in 2012. The participants comprised 15 nurses, five midwives, and four paramedics. The participants were currently employed in metropolitan and regional Australia. Their demographic details are outlined in Table 3. Four themes arose from the data. The first theme revealed participants had different views on physical health in comparison with the Australian Government recommended guidelines. The second theme identified that physical and emotional health are important to job satisfaction. The two remaining themes identified the importance of increasing physical activity levels and a relationship between physical health and stress. Table 4 summarizes these findings. The biggest thing I have an issue with at the moment is food. I am always eating on the run. Physical health, to me, is probably more about well-being [than] any particular ongoing health conditions, especially in regards to work, getting enough sleep, eating right, getting up in the morning with enough energy, feeling good as opposed to feeling run down all the time. I am not the best I have been. I am not as fit as I used to be. Night shift does not help. Our night shift goes for 14 hours – the feeling of fatigue – it puts a lot of stress on the body. Sometimes you are out all night. I was fatigued 70%–80% of the time – want to sleep in [and], throughout the day I want[ed] to go back to bed. This was what constituted my days off. Work does impact. My back injury was due to CPR and then lifting the patient. Job satisfaction just went downhill. There is nothing wrong with my back; fortunately I am in good health … . So many of the nurses of my age who have been lifting all the time and been doing so for 20–25 yrs, they are very tired, and their backs are sore, and they can’t do what I can do. I am very grateful … I can keep up with the younger ones. I know it’s terrible … I prioritize physical health, right to the bottom of the page. If I have time, I have a massage, which is few and far between, but it would be lovely to exercise and be fit. To tell the honest truth, I don’t do anything. I’ve got five children, so I’ve got to look after the needs of those guys. Generally I come last. Penny, a midwife provided further insight into this perspective. My current emotional and physical health could be improved … don’t feel like I do enough walking, meditating etc … . I am not sufficiently disciplined … if I came to something regularly, it may motivate me. Physical health is not supported. Fire [personnel] get free gym membership but Ambulance [personnel] do not … . I would like to see gym at work, free running shoes … . Health and well-being programs to include fitness, anxiety, depression, impacts of smoking and drinking. The questionnaire demonstrated 23 of 24 participants had a moderate- to high-level of stress.43 Paramedics were the most stressed, the midwives had a similar level of stress, and the nurses were disproportionally lower, respectively scored at 75, 73.78, and 56. The total group stress level was identified to be in the moderate stress range, at 65. A lot of times when I try to pinpoint why I am not at work, it comes back to how I am feeling physically and emotionally … . I am very stressed out and very tired … . I sometimes feel the “stresses” … [are] going to be the chain breaker – make me leave … . I would prefer to be looked after more … it goes both ways – affecting my decision to stay or leave. The findings indicate the importance of physical health to health care professionals, and this extends beyond physical activity, nutrition, and recovery. Similarly, previous health studies and literature have identified factors such as physical inactivity, poor nutrition, and fatigue as impacting upon physical health.47,48 These factors increase the risk of poor health, including cardiovascular/metabolic diseases and musculoskeletal injuries, which consequently impact upon work performance. Our research has confirmed this finding. These findings add to the existing literature on the insidious nature of the stress experienced by health professionals, where stress has been identified as integral in all workplace settings and associated with job dissatisfaction and intention to leave.35 While not specifically measuring for burnout in the questionnaire, the research participants used the term burnout in their interviews. Burnout was identified as a pervasive stress response, and it was also identified that unremitting fatigue, due to long working hours, shift work, staff shortage, and limited resources, impacted on participants’ ability to maintain an acceptable physical health status. Our findings indicated that components of physical health, especially physical activity, were not well utilized to manage stress. Engagement in physical activity attenuates the effects of stress, job burnout, and dissatisfaction.52 It has been found that workers in high-stress, demanding occupations who were physically active and engaged in high-intensity activity were able to reduce stress levels and increase their levels of energy.53 Furthermore, it was shown that intervention programs that focused on physical activity behavior improved anxiety outcomes in nurses.54 While the complexity of factors impacting on individual’s stress level necessitates diverse stress interventions, increased levels of physical activity is a key consideration. Two other important findings of the current study were that 1) health professionals’ perception of their physical health was more focused on a sense of well-being than on being able to have an optimal level of physical health for job performance; and 2) participants had a desire to increase their physical activity levels to improve their physical health. Both of these findings can provide reliable background information to develop further research. Specifically, research should be directed to improving workplace environments to, in turn, provide more opportunities for health professionals to achieve personalized health activities. Work pressure is an issue that results in health professionals’ inability to meet the minimum levels of physical activity that they desire; this, along with the high level of stress, results in suboptimal physical competency and lower levels of professional performance, increasing their risk of injury and disease. This study is representative of the participants who were involved. This study was conducted in a large metropolitan city in Australia. It is not known what the results would have revealed had the study been conducted in a rural area or in another metropolitan city in Australia or beyond. The study may have revealed different results if the methodological approach had been different, for instance, as in an ethnographic, observational study. As this was a small mixed-method study, it was not intended that the results be generalizable; however, the results may inform the development of subsequent research and future wellness programs for health care professionals. While, a small sample size may be considered a limitation of the study, most of the data were qualitative. It is evident that these results have demonstrated some health care professionals’ current lifestyle interventions need to be improved. Therefore, it is imperative that health-based organizations take responsibility to develop wellness programs that support health professionals’ healthy lifestyle management. The authors thank Australian Catholic University, for the competitive funding to conduct this research, and the participants, for their willingness to share their experiences and their commitment to healthy workplaces. Glass N. An investigation of nurses’ and midwives’ academic/clinical workplaces: a healing model to improve and sustain hope, optimism, and resilience in professional practice. Holist Nurs Pract. 2009;23(3):158–170. Lim J, Bogossian F, Ahern K. Stress and coping in Australian nurses: a systematic review. Int Nurs Rev. 2010;57(1):22–31. who.int [homepage on the Internet]. WHO definition of health. World Health Organization; 1946. Available from: http://www.who.int/about/definition/en/print.html. Accessed February 13, 2014. National Institutes of Health. Physical activity and cardiovascular health. NIH Consens Statement [online]. Dec 1995 [cited 2014 February 13];13(3):1–33. Available from: http://consensus.nih.gov/1995/1995ActivityCardivascularHealth101html.htm. Accessed February 13, 2014. Brown WJ, Bauman AE, Bull FC, Burton NW. Development of Evidence-Based Physical Activity Recommendations for Adults (18–64 Years). Canberra: Department of Health and Ageing; 2012. Tsismenakis AJ, Christophi CA, Burress JW, Kinney AM, Kim M, Kales SN. The obesity epidemic and future emergency responders. Obesity (Silver Spring). 2009;17(8):1648–1650. Zapka JM, Lemon SC, Magner RP, Hale J. Lifestyle behaviours and weight among hospital-based nurses. J Nurs Manag. 2009;17(7):853–860. Pietroiusti A, Neri A, Somma G, et al. Incidence of metabolic syndrome among night-shift healthcare workers. Occup Environ Med. 2010; 67(1):54–57. Daraiseh NM, Cronin SN, Davis LS, Shell RL, Karwowski W. Low back symptoms among hospital nurses, associations to individual factors and pain in multiple body regions. Int J Ind Ergon. 2010;40(1):19–24. Ngan K, Drebit S, Siow S, Yu S, Keen D, Alamgir H. Risks and causes of musculoskeletal injuries among health care workers. Occup Med (Lond). 2010;60(5):389–394. Schluter PJ, Turner C, Huntington AD, Bain CJ, McClure RJ. Work/life balance and health: the Nurses and Midwives e-cohort Study. Int Nurs Rev. 2011;58(1):28–36. Vasconcelos S, Marqueze E, Gonçalves L, et al. Morbidity among nursing personnel and its association with working conditions and work organization. Work. 2012;41 Suppl 1:S3732–S3737. Rogers AE, Hwang WT, Scott LD, Aiken LH, Dinges DF. The working hours of hospital staff and patient safety. Health Aff (Millwood). 2004;23(4):202–212. Chen J, Davis KG, Daraiseh NM, Pan W, Davis LS. Fatigue and recovery in 12-hour dayshift hospital nurses. J Nurs Manag. Epub April 23, 2013. Gutwirth H, Williams B, Boyle M, Allen T. CPR compression depth and rate in relation to physical exertion in paramedic students. Journal of Paramedic Practice. 2012;4(2):90–95. Gutwirth H, Williams B, Boyle M. Rescuer fatigue in cardiopulmonary resuscitation: a review of the literature. Journal of Emergency Primary Heath Care. 2009;7(4):1–9. Pijl-Zieber EM, Hagan B, Armstrong EC, Hall B, Atkins L. Stingl M. Moral distress: an emerging problem for nurses in long-term care? Quality in Ageing and Older Adults. 2008;9(2):39–48. Görgens-Ekermans G, Brand T. Emotional intelligence as a moderator in the stress-burnout relationship: a questionnaire study on nurses. J Clin Nurs. 2012;21(15–16):2275–2285. Glass N. Investigating women nurse academics’ experiences in universities: the importance of hope, optimism and career resilience for workplace satisfaction. Annual Review of Nursing Education. 2007;5:111–136. Ilhan MN, Durukan E, Taner E, Maral I, Bumin MA. Burnout and its correlates among nursing staff: questionnaire survey. J Adv Nurs. 2008;61(1):100–106. Cowin LS, Johnson M, Craven RG, Marsh HW. Causal modeling of self-concept, job satisfaction, and retention of nurses. Int J Nurs Stud. 2008;45(10):1449–1459. Pannowitz HK, Glass N, Davis K. Resisting gender-bias: insights from Western Australian middle-level women nurses. Contemp Nurse. 2009;33(2):103–119. Jordan K, Fenwick J, Slavin V, Sidebotham M, Gamble J. Level of burnout in a small population of Australian midwives. Women Birth. 2013;26(2):125–132. Mollart L, Skinner VM, Newing C, Foureur M. Factors that may influence midwives work-related stress and burnout. Women Birth. 2013;26(1):26–32. Courtney JA, Francis AJP, Paxton SJ. Caring for the carers: fatigue, sleep, and mental health in Australian paramedic shiftworkers. Australian and New Zealand Journal of Organisational Psychology. 2010;3:32–41. Brough P. Comparing the influence of traumatic and organizational stressors on the psychological health of police, fire, and ambulance officers. Int J Stress Manag. 2004;11(3):227–244. worksafe.vic.gov.au [homepage on the Internet]. Injury hotspots: Ambulance service. WorkSafe Victoria; 2008. Available from: https://www4.worksafe.vic.gov.au/worksafe/hotspots/ambulance_hotspot.html. Accessed February 13, 2014. Meadors P, Lamson A, Swanson M, White M, Sira N. Secondary traumatization in pediatric healthcare providers: compassion fatigue, burnout, and secondary traumatic stress. Omega (Westport). 2009–2010; 60(2):103–128. Leinweber J, Rowe HJ. The costs of ‘being with the woman’: secondary traumatic stress in midwifery. Midwifery. 2010;26(1):76–87. Regehr C, Goldberg G, Hughes J. Exposure to human tragedy, empathy, and trauma in ambulance paramedics. Am J Orthopsychiatry. 2002;72(4):505–513. Courtney JA, Francis AJ, Paxton SJ. Caring for the country: fatigue, sleep and mental health in Australian rural paramedic shiftworkers. J Community Health. 2013;38(1):178–186. Alexander DA, Klein S. First responders after disasters: a review of stress reactions, at-risk, vulnerability, and resilience factors. Prehosp Disaster Med. 2009;24(2):87–94. Bentley MA, Crawford JM, Wilkins JR, Fernandez AR, Studnek JR. An assessment of depression, anxiety, and stress among nationally certified EMS professionals. Prehosp Emerg Care. 2013;17(3):330–338. Lamontagne AD, Keegel T, Louie AM, Ostry A, Landsbergis PA. A systematic review of the job-stress intervention evaluation literature, 1990–2005. Int J Occup Environ Health. 2007;13(3):268–280. Ritter D. The relationship between healthy work environments and retention of nurses in a hospital setting. J Nurs Manag. 2011;19(1):27–32. Cowin LS, Hengstberger-Sims C. New graduate nurse self-concept and retention: a longitudinal survey. Int J Nurs Stud. 2006;43(1):59–70. Orrock M, Lawler J. Health care system reform and senior nurse managers: marginalization as a factor contributing to the nursing crisis. International Journal of Interdisciplinary Social Sciences. 2006;1(2):69–72. Daehlen M. Job satisfaction and job values among beginning nurses: a questionnaire survey. Int J Nurs Stud. 2008;45(12):1789–1799. Patterson PD, Moore CG, Sanddal ND, Wingrove G, LaCroix B. Characterizing job satisfaction and intent to leave among nationally registered emergency medical technicians: an analysis of the 2005 LEADS survey. J Allied Health. 2009;38(3):e84–e91. Coomber B, Barriball KL. Impact of job satisfaction components on intent to leave and turnover for hospital-based nurses: a review of the research literature. Int J Nurs Stud. 2007;44(2):297–314. McCarthy G, Almeida S, Ahrens J. Understanding employee well-being practices in Australian organizations. Int J Health Wellness Soc. 2011;1(1):182–198. Glass N, Ogle KR, Webb H, Rice V, Yeboah C. Wellness for work: perspectives from nurses, midwives and paramedics in Australia. The International Journal of Health, Wellness and Society. 2014;3(1):23–39. Glass N. Interpersonal Relating: Health Care Perspectives on Communication, Stress and Crisis. South Yarra: Palgrave Macmillan; 2010. Sadler GR, Lee HC, Lim RS, Fullerton J. Recruitment of hard-to-reach population subgroups via adaptations of the snowball sampling strategy. Nurs Health Sci. 2010;12(3):369–374. Borbasi S, Jackson D. Navigating the Maze of Research: Enhancing Nursing and Midwifery Practice. 3rd ed. Chatswood: Mosby Elsevier; 2012. Baer HJ, Glynn RJ, Hu FB, et al. Risk factors for mortality in the nurses’ health study: a competing risks analysis. Am J Epidemiol. 2011; 173(3):319–329. Hegg-Deloye S, Brassard P, Jauvin N, et al. Current state of knowledge of post-traumatic stress, sleeping problems, obesity and cardiovascular disease in paramedics. Emerg Med J. Epub January 12, 2013. Tourangeau AE, Cranley LA. Nurse intention to remain employed: understanding and strengthening determinants. J Adv Nurs. 2006;55(4):497–509. Vessey JA, Demarco R, DiFazio R. Bullying, harassment, and horizontal violence in the nursing workforce: the state of the science. Annu Rev Nurs Res. 2010;28:133–157. Cox Dzurec L, Bromley GE. Speaking of workplace bullying. J Prof Nurs. 2012;28(4):247–254. Toker S, Biron M. Job burnout and depression: unraveling their temporal relationship and considering the role of physical activity. J Appl Psychol. 2012;97(3):699–710. Hansen AM, Blangsted AK, Hansen EA, Søgaard K, Sjøgaard G. Physical activity, job demand-control, perceived stress-energy, and salivary cortisol in white-collar workers. Int Arch Occup Environ Health. 2010;83(2):143–153. Conn VS. Anxiety outcomes after physical activity interventions: meta-analysis findings. Nurs Res. 2010;59(3):224–231.